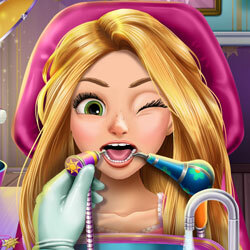 Description: Even the beautiful Blonde Princess can`t get away from cavities and she has to go fast to the dentist. Save her from the pain of the toothache in your office and try to fix her problem. Pick up your instruments to see where the cavity is, calm the patient when she is not feeling well and the Blonde Princess will have perfect teeth again.